Cisska car cover meets your standard vehicle protection needs.This car covers fits your vehicle with style and precision. Keep Rain, Frost, pollutant, sleet, and frost off your glass and paintwork, so that when your ready to go – so is your car ! 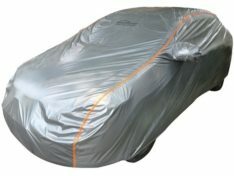 Produced from top quality and these full car covers are designed to offer superior defense from damage caused by all Weather. Why not holistic protection. More covering, less cleaning or repair.